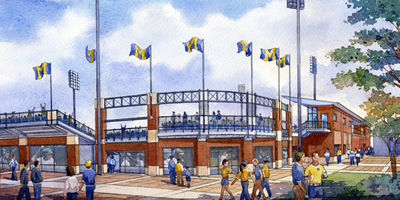 The Wilpon Baseball and Softball Complex project features a renovation and addition for the existing Alumni Field of approximately 6,000 gross-square-foot addition, and new grandstands and outfield seating for approximately 2,300 spectators, including accommodations for barrier-free spectator areas. The project includes new public restrooms, concession areas, media facilities, an indoor practice facility, and the creation of pedestrian plaza areas at the entrances. The Donald R. Shepherd Softball Building, built in 1998, will be expanded to allow for additional team meeting and athletic training areas. The scope of the project includes the architectural, mechanical and electrical work necessary to accomplish these improvements.